On October 5, 2015, the United States Court of Appeals for the Second Circuit issued a 65-page decision holding that, for the most part, the 2013 Vessel General Permit (VGP) promulgated by the Environmental Protection Agency (EPA), was arbitrary, capricious and not in accordance with the law. The court declined, though, to vacate the VGP, but allowed it to remain in effect until the EPA issues a new VGP. The 2013 VGP had adopted, almost completely, the standards established in the International Convention for the Control and Management of Ships’ Ballast Water and Sediments, 2004 (BWM Convention). What had looked like a settled and deliberate process for encouraging final adoption of the BWM Convention has suddenly been derailed. Nations and other stakeholders that had calculated that the coming into force of the Convention would largely provide for a uniform international regime may now have to go back to the drawing boards. The major incentive for nations that have been planning to ratify the BWM Convention has been eliminated, as it is unlikely that the ultimate U.S. regime will be consistent with that Convention. The EPA was sued by various environmental advocacy groups, led by the Natural Resources Defense Council (NRDC). Petitioners used three basic lines of attack in their challenge. First, they argued that the technical standards (officially known as “technology-based effluent limits” or TBELs) in the VGP were deficient. Second, they argued that the quality standards (officially known as “Water Quality-Based Effluent Limits” or WQBELs) in the VGP were deficient. Finally, they argued that the monitoring and reporting requirements in the VGP were contrary to the law. With one narrow exception, the court ruled in favor of petitioners. TBELs set effluent limitations on a point source (such as a vessel discharging ballast water) based on how effectively technology can reduce the pollutant being discharged. All parties to the litigation agreed that untreated ballast water is a pollutant as defined by the Federal Water Pollution Control Act (FWPCA). In enacting the FWPCA, and particularly that portion known as the National Pollutant Discharge Elimination System (NPDES), Congress designed the TBELs standard to be ‘technology forcing’, meaning it should force agencies and permit applicants to adopt technologies that achieve the greatest reductions in pollution. For nonconventional pollutants, such as ballast water potentially containing invasive species, the EPA is required to set effluent limits based on the best available technology economically achievable or BAT. The court found that the EPA process for establishing the 2013 VGP was deficient in several regards. Evidence showed that the EPA defaulted to the standards established in the BWM Convention, rather than conducting a wide-ranging analysis of potential approaches. While the EPA commissioned several studies of the ballast water issue, it inappropriately limited those studies to examination of ship-board technologies, foreclosing any analysis of the costs and benefits of shore-based approaches. The EPA also ignored evidence that several of the available ship-board technologies were able to achieve levels of performance that exceeded, to some extent, the limits established in the BWM Convention. WQBELs, which supplement TBELs, are intended to prevent degradation of the quality of the water into which a discharge will occur. The limit is based on the amount and kind of pollutants involved and is set without regard to cost or technology availability. The EPA is required by the FWPCA to ensure compliance with its narrative criteria, designated uses, and antidegradation policies. In the 2013 VGP, the EPA requires all vessels to control discharges “as necessary to meet applicable water quality standards in the receiving water body or another water body impacted by the discharges.” The court found that this standard is insufficient to give a shipowner guidance as to what is expected or to allow any permitting authority to determine whether a violation has occurred. The WQBELs do not state how they will ensure compliance. The court dismissed EPA’s contention that determining a more specific standard is difficult, holding that scientific uncertainty does not allow the agency to avoid its responsibility for regulating discharges. Further, the EPA failed to implement best management practices (BMPs) as an alternative. The FWPCA requires that NPDES permits include conditions that require permittees both to monitor compliance with the TBELs and WQBELs and to report the results of that monitoring. The 2013 VGP requires vessels to monitor the functionality of their BWM systems, if installed, and the concentrations of two “indicator” bacteria. 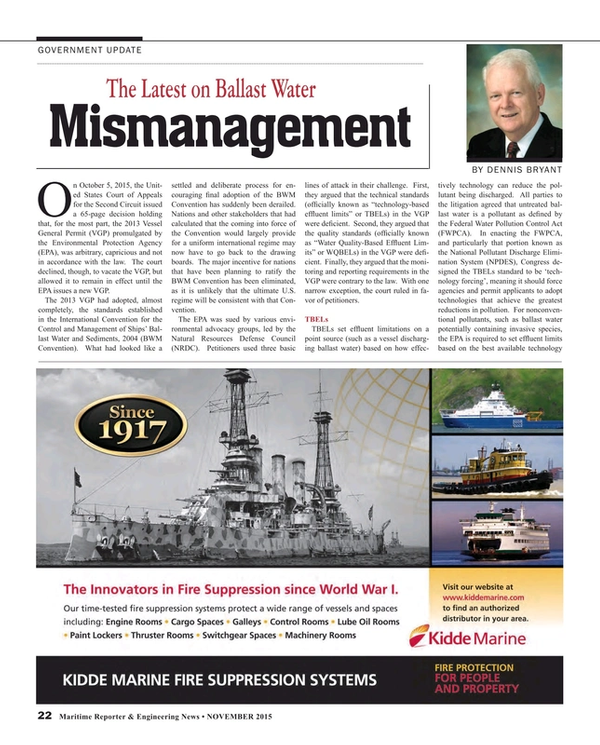 The court found the functionality monitoring requirement to be insufficient because it fails to determine whether unpermitted pollutants are being discharged, noting that the EPA acknowledges that BWM systems meeting BWM Convention standards allow discharge of a certain level of contaminated ballast water. Thus, EPA’s reliance on functionality monitoring is misplaced. The VGP requires vessels to report intended ballast water discharges. The court found that vessels should be required to report actual ballast water discharges instead. It must be noted that, for the most part, the court did not rule that the 2013 VGP standards implemented by the EPA were wrong. Instead, it ruled that the articulated rationale of the EPA in its adoption of those standards was deficient. In some cases, such as possible use of shore-based ballast water treatment, the EPA failed to consider a potentially viable option. In other cases, such as the apparent availability of shipboard ballast water treatment systems that exceeded the BWM Convention standards, the EPA failed to explain why it did not mandate use of such systems. Thus, at least in theory, the EPA could ultimately reissue the 2013 VGP provisions with a more thorough examination and explanation. This is unlikely to occur. The EPA must now reopen its VGP process and more thoroughly examine the various options regarding ballast water management and the costs and benefits of each option. In particular, it must study shoreside treatment options, as well as the capabilities of the numerous BWM systems on the market or under development. This presents opportunities for manufacturers. Those who have capabilities regarding shoreside treatment of ballast water may want to bring their systems to the attention of the EPA. Likewise, those who have or can develop shipboard systems that exceed IMO standards may have an opportunity to garner some attention from the next EPA study. As pointed out in the court decision, the EPA permitting process is intended to be ‘technology forcing’. At the same time, the IMO should consider reexamining its consideration of BWM systems, rather than resting on its work to date. Ultimately, this reopened VGP process may provide opportunities for serious competition in the area of ballast water management. If so, the challenges emanating from this decision may be ultimately beneficial, although currently unsettling.